Yesterday was my wedding anniversary, 16 years married to a great man. The Strange thing is we don’t really even acknowledge our wedding anniversary preferring instead to honor our first date as the special day of relationship celebration. So it wasn’t strange really when Brent’s annual men’s backpacking trip found itself scheduled in such a way as to make it that Brent and I would not even be together for our anniversary. We celebrated our 20th anniversary of being together last February and we did that in a big way, so missing this date together was fine by both of us. When yesterday I received a collect call from Brent first thing in the morning, I thought, “wow, he wants to say happy anniversary after all and as he’s in the middle of nowhere about to start his trail for the day, a payphone will have to do.” Turns out, he forgot something and needed to have me arrange for it to make its way to San Fransisco for when he is there following backpacking. After I let him know I thought he was calling to wish me a happy anniversary, we both laughed and loved in a long distance, lots of men waiting to go, kind of way. It was enough and sweet. What’s strange is that even though we don’t really celebrate our wedding anniversary the event of our wedding was highly impactful to our couple-hood. I believe in the power of ceremony. I have felt first hand the transformational significance of ritual. 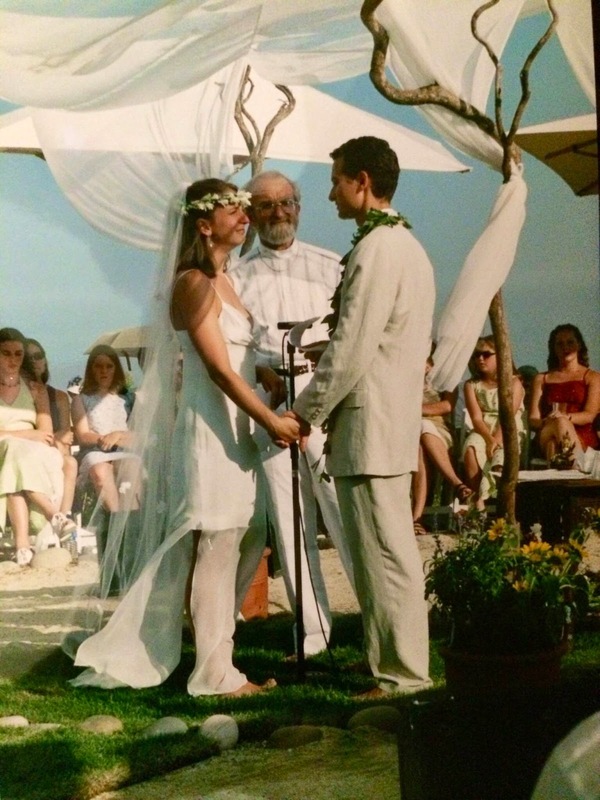 The ceremony that took place in the center of a medicine wheel, on a bluff overlooking the Pacific Ocean, in the glaring heat of July, and surrounded by our most beloved people, that ritual of union made a difference in our lives together and how we have held our relationship ever since. Like most couples, we took special care in planning our ceremony to have as much meaning as possible. We wanted the ritual to be filled with aspects that added to the power of the day rather than empty tradition. 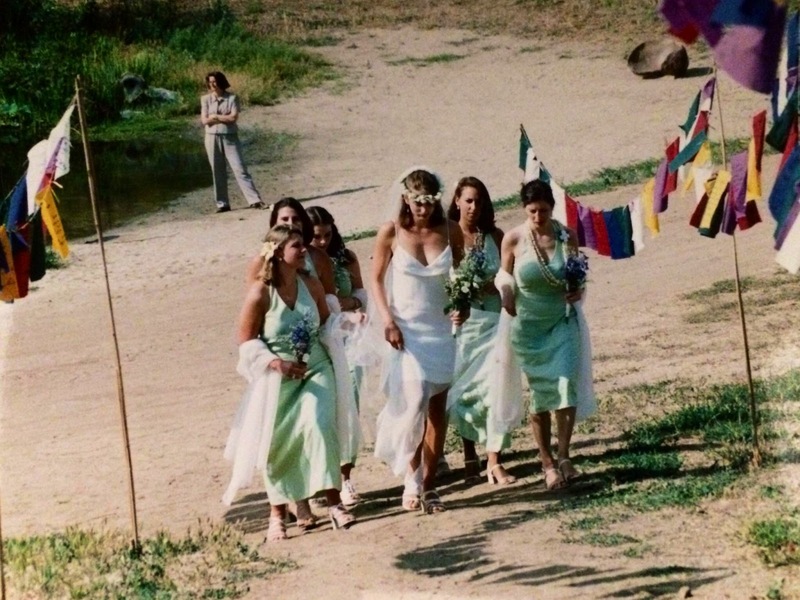 And, we wanted everyone there to feel they were part of the ceremony, infused with love and witness to our commitment. There were lots of aspects to our wedding that were meaningful to us; the prayer flags written by our friends and family, feeling the grass beneath my feet grounding me, walking in guided by the lovely voice of Julie, opening the ceremony with our beloved yoga teacher, Chuck, leading us all in chanting OM, flower leis bringing in my link to Hawaii, breaking the glass (and being barefoot added additional challenges there!) and standing under the chuppa connecting us to Brent’s Jewish heritage (and as I had hand made the supports and my aunt sewn the cloth it connected us to my heritage as well), and the powerful sharing offered by loved ones in the council circle. I’m sure there were others, but these are the ones that stick in my mind when I reflect back on that day, those bits and the heat. Perhaps the heat was a needed part as well, for all alchemical processes require heat! Heat we got! I remember sweat trickling down the backs of my legs while I stood there in the center of the circle facing my beloved. I had a spot of poison oak just behind my knees and the sweat tickled it as it found its course down the river of my legs. I don’t mind these memories as it was in part that sweat trickle that helped keep me present. I remember being in our ceremony, there, with Brent, connected to the profundity of what we were doing, and awake. The heat, the sweat, the mild discomforts were welcome then as they are now. Our wedding, like our marriage, did not aim for perfection and elimination of the Shadow. Instead, we have used difficulty to deepen, grow, and continually use our marriage as an alchemical vessel for ever-evolving transformation. It certainly hasn’t always been pretty! And… the aspect of our wedding ceremony that has had the biggest and most obvious contribution to our marriage has to be our vows. 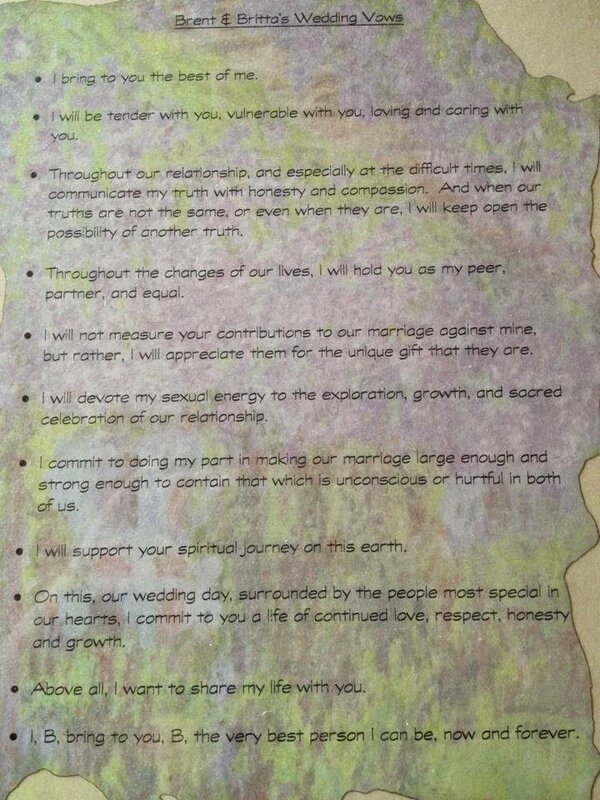 We spent a long time working on our vows, crafting them to be everlasting in their significance and power. They are not particularly pretty nor dressed up in white light, rather they are raw, true, and aspirational in their difficulty to live! We hold our vows as intentions for our marriage, the container for our relationship and our commitments to one another. We fail at them often, we measure our contributions against each other, forget to hold open the possibility of another truth, and get pissed when our spiritual journey gets in the way of practical living. 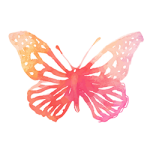 When we remember, we use our vows to redirect us back to what we hold to be most important. Marriage is not an easy path. I’m immensely grateful Brent and I decided to take the step that involved ritualizing the relationship we already had. Meaningful ritual has held our relationship through the high points and been the glue during the difficult ones. It has sometimes felt far worse than sweat tickling poison oak, challenge that has helped me stay present even if I want to run. Staying with and exploring the shadowy parts of our relationship even when we don’t want to…that practice has roots in our vows. 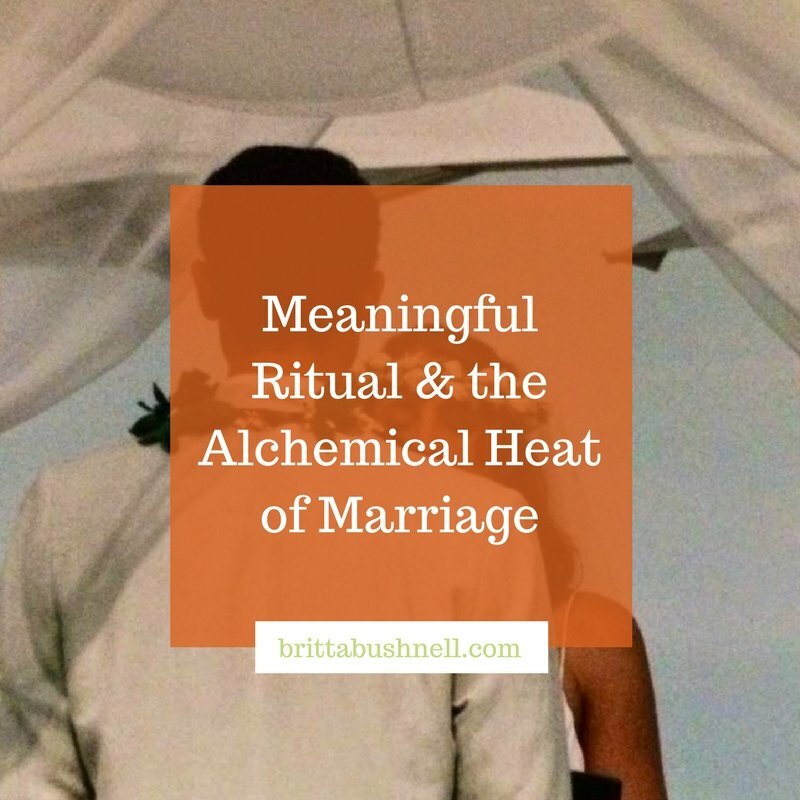 We may celebrate the day of our first date, but our wedding day marked the moment the alchemical process of transformation was truly placed over the fire of change. Anyone there on that mountaintop can attest to the heat.